Tri-Cities retail sales tax collections bounced in July. At the same time, East Tennessee MSAs claimed a big share of the top collection performers statewide. Year-over-year change in seasonally adjusted collections reported by MTSU’s Department of Economics and Finance show a continued uptrend, but growth began softening in March – with one exception. The Johnson City MSA experienced a spike in May which was negated by the only year-over-year loss that metro area has felt in the past 14 months. The local increase parallels the 0.3% increase in consumer spending nationwide. Much of July’s U.S. increase came with stronger auto and truck sales. Speculation over the effect of CarMax’s entry into the local auto sales market will have to wait for a couple of quarters to see if it increases overall sales, or captures some of the outbound sales and redistributes the existing market share. Conditions for continued resilient consumer spending is basically the same in the local and U.S. economies. Job and payroll grown are gradually increasing, and lower gasoline prices have afforded households extra budget room. Service spending is also a little stronger force in the local economy than it is nationwide due to the aging of our demographic. The government’s consumer metric in retail doesn’t account for services consumption. 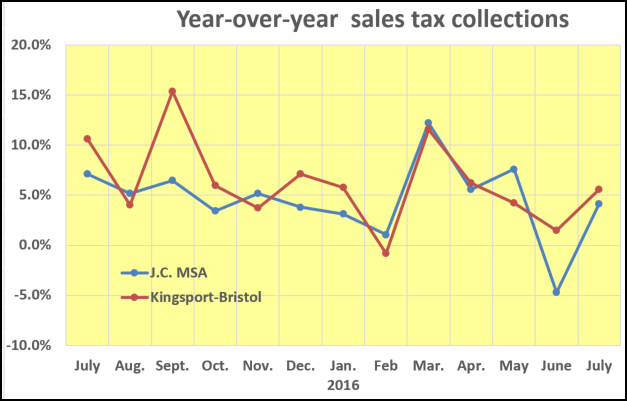 Since last July the Kingsport-Bristol MSA has outperformed the Johnson City MSA in retail sales collections eight times. Johnson City has not managed a 50% share of the region’s total collections since February 2015. July’s share was 48.5%, and the share has been ebbing lower since May. Tennessee year-over-year collections were up 6% in July, and the Nashville MSA led the state with its 7.1% increase. Knoxville and Kingsport-Bristol were neck-in-neck for July’s second highest performers with 5.8% and 5.6% increases. Morristown was also in the 5% plus increase group.